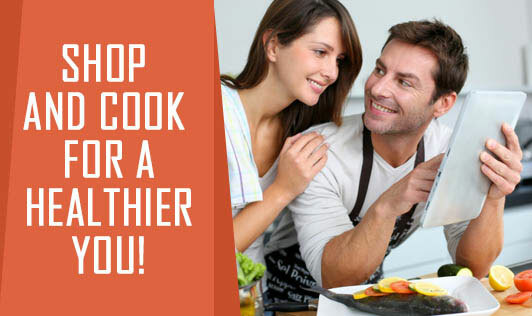 Shop and Cook for a healthier you! The shopping list can be based on the MyPlate food groups (The MyPlate food groups put foods with similar nutritional value together) including a variety of healthy food choices. Make a meal plan and list of snacks. Confirm which ingredients you already have, and add the ones you don’t have to the list so that you don't end up throwing away a lot of what you buy. Read labels: It will help you to look to the nutrition aspects of foods, like trans-fats, hydrogenated oils, high amounts of sugar, saturated fat, sodium, cholesterol. So, you can avoid these foods and can go for foods rich in fiber, good fats, protein, vitamins, calcium etc. Go for whole foods: The processed foods mainly lacks in nutrition. So one can opt least processed foods like: whole grain instead of white or wheat bread, fresh fruit instead of canned or juice, whole grain cereal or oatmeal instead of refined cereals. Don’t buy junk food: Despite the fact that they offer very little nutrition and are packed with unhealthy ingredients, they are also very expensive. So, stop buying processed and unhealthy foods, and buy something healthy and of higher quality. Shop seasonal foods: As Seasonal foods are generally nutritious, healthy and comparatively less expensive as compare to non- seasonal ones. It is best to opt for the food rich in both nutrients and flavor. Builds healthy habits: Cooking at home can boost your health! By preparing healthy recipes, creating and sticking to a meal plan can inspire you to live a healthy life. Saves Money: Eating out is expensive as compared to the meals prepared at home, as its lot more cost-effective to purchase groceries than ordering or going out to have your meals. Awareness of food allergies & sensitivities: Cooking for yourself and your family also gives you control to avoid food allergens. Which is not possible if you are eating out. Common food allergies include nuts, gluten, shellfish etc. Prepare more of your own meals: Cooking more meals at home can help you take charge of what you’re eating and better monitor exactly what goes into your food, which will help you to avoid chemical additives, added sugars, and unhealthy fats. Include healthy methods of cooking: There are plenty of ways to cook healthy, tasty and flavorful meals without adding unnecessary extras. Which are as follows, boiling, steaming, microwaving, poaching, grilling and broiling. So, with a little planning, you can make the most of your grocery shopping trip and get the healthiest foods possible to begin building your nutritious meals.